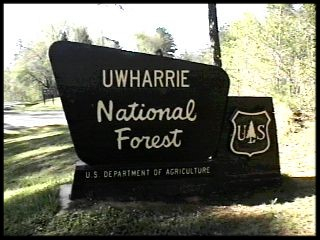 Please note that due to a wildfires in western North Carolina, our trip this weekend to South Mountains State Park has been relocated to the Uhwarrie National Forest, east of Albemarle. Mr. Rozear presented the changes on Monday night to the PLC and facilitated a discussion led by several senior Scouts regarding cold weather backpacking. Will need to make sure we have the 5 gal containers full on Sat a.m. and Sat afternoon when the Troop will next see the Trailer to refill if needed. It is about a 2 hour drive to the trail head (TH) on Fr night. The TH for Fr night is on SR 1306 . We are staying at Yates Place camp ground on Sat. We will retrace our steps back north for a take out at the TH on Route 109. We will be hiking about 11 miles on Saturday and 3 miles on Sunday. 2 Topo maps - One of the top half of the trail (NOTE The Saturday Camp designation on this map is incorrect -= We Will NOT STAY THERE!). The second is the bottom half of the trail with the Yates Place Camp. NOTE - The two maps are on two different scales. Use the first map to navigate to Route 109. Use the second to get you from Route 109 to the Yates Place Camp. We need two adults to act as shuttlers for the trip. They will take the bus and trailer from the TH on SR 1306 to the TH on Route 109 on Sat. They will likely need to distribute water to all as the Troop crosses Route 109 on Sat afternoon. The shuttlers can then hike in with the last group to the camp site. We will cancel the planned hamburger grilling on Sun. Therefore all patrols need to plan a standard lunch. We will have trailer access on Fr night/Sat a.m.